The new breed of Cajun musicians had no more promising a representative at the close of the 20th century than Kristi Guillory, who grew up in the heart of the Acadian nation and was fiddling with the buttons and keys on an accordion at an age when many other little girls are dressing Barbie dolls. There are Cajun fans who love her music simply because she represents a long-overdue wave of female musicians in a genre that has always been an exclusive male turf, but what really gives her music staying power is her personal fascination, and literal immersion, into the French-American culture. 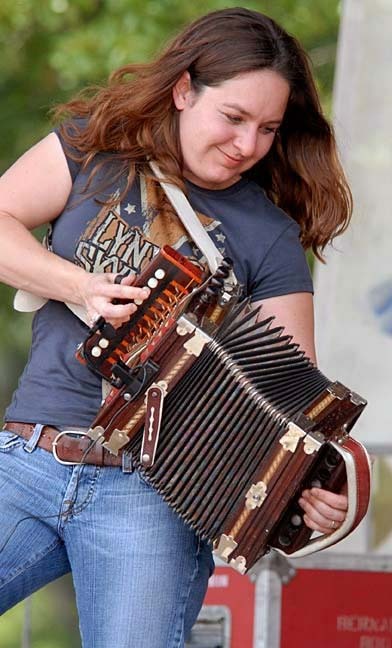 Her probing mind and well-above average intelligence, combined with firm grounding and love of the tradition, seems like it could be something of a requirement for survival as Cajun music rocks on into the 21st century. But although Guillory never seems to shut music out of her life completely, she has also been pursuing an academic career complete with its requirements of massive time outlay. Whether her true life's work would be in music or an academic field related to the French language was so unclear in 1997 that columnists on the Cajun music scene were joking about her being in "semi-retirement" from music at the ripe age of 18. She began playing at the age of 11 and the story has been romanticized to the point where the music just came pouring out of her one night when she decided to fiddle with her mom's accordion at a social gathering. As soon as she started learning to play, she began attending jam sessions, particularly the events held at Rex Champagne's Gas Station in Judice, LA. This was actually a gas station, not a venue with a down-home sounding name, and the proprietor of the same name is a legendary Cajun character known for his harmonica playing as well as drumming. She would sit back and watch Rex Champagne and his guests go at it, becoming more and more confident of her own abilities. This also included songwriting and singing, at which she has a superb reputation. In 1995, she received the Female Vocalist of the Year award from the Cajun Music Association, one of the youngest artists to pick up such an honor. Despite this early success, she was driven to become fluent in French. In 1999, she was invited to attend a French Immersion class at St. Ann's University in Nova Scotia. Of course, wherever she goes she brings her music interest with her, and she carved time out from her studies for the Racine project that was formed with musicians from that province. She has also recorded several CDs with the Reveille band, New Cajun Generation and La Danse Des Ancetres, both on the Swallow label. She is also in Veilee, a group featuring a collection of well-known Cajun vocalists. Her songwriting is a particularly interesting connection to her affinity for the French language and Cajun culture. The woman's traditional association with the home, the genre's fascination with "home songs," and material extolling the comforts of the simple Cajun way of life are not connections she chooses to ignore. All the songs she wrote in the first phase of her career had French lyrics and one of her most famous, "Fer d'Etre Cadien," has just such a theme and focuses on just such basic pleasures. Guillory is a particular inspiration to even younger Cajun musicians from the generation after her. One such band, La Bande Feufollet, recorded a cover version of this song.